Epsilon – now known as Epsilon Euskadi – has revealed this early view of its LM GTP design for Le Mans in 2007, writes Sergio Fonseca. 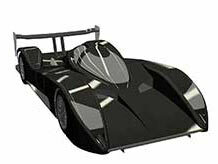 The car has been designed by John Travis and will be built at Centro de Alto Rendimiento, Gipuzkoa, Spain. There are more than 30 staff working on the first Spanish prototype for Le Mans. Epsilon Euskadi is currently involved in the World Series by Renault and Mégane Trophy but Joan Villadelprat, Michel Lecomte and Carlos Molla are setting out to become a full-blown manufacturer, with the intention of entering two cars at Le Mans in 2007. They have high hopes of selling cars after that.